An image of children crouching by the lego bricks and surrounded by the rubble of what could be their homes in Syria has been circulating in the media. 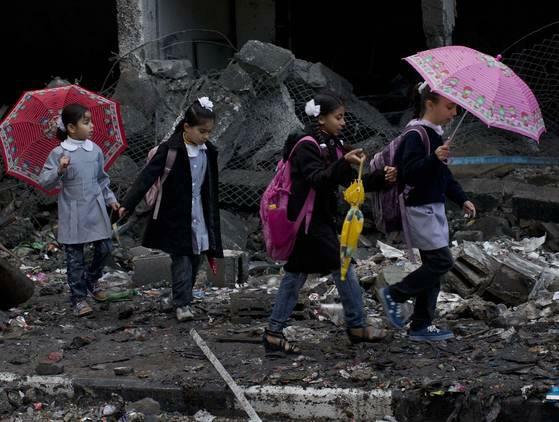 They recall the ones of childhoods in ruins from Gaza several months previously. These images offer a somewhat voyeuristic peek into the intimacy of the reality on the ground for the millions of children caught up in war zones. Prof. Derek Gregory talks about war’s ‘Deadly embrace’ in relation to ‘ distance and intimacy ‘ and countering the idea that war is something that happens far away, describes various mechanisms put in place, over the centuries, to bring the war closer to home- to tell people the story. In todays media saturated world we view things in real time, we have access to thousands of images and commentaries. And as for the soldiers who are in charge of the planes that drop the bombs or the rifles that shoot the bullets that cause the havoc and utter distraction- even they are not necessarily miles away- as often claimed by those who link contemporary warfare to the video games-even for them- as they sit in front of the screens that separate between them and the ‘reality on the ground’ – the ‘zones’ are just there- are several inches away from the screens and the destruction they cause in great detail, is viewable as close up as anyone might wish.